Do you ever have a project that you are really excited to finish and then you just lose your drive and it gets put last on the list of things to make? Well the Map Quilt was on of those projects. I am happy to report that I have finally finished off the Map Quilt! My kids are happy it's finished too. As I mentioned in a previous post that had it quilted already but I wanted to make it bigger and add a border using a quilt-as-you go method. 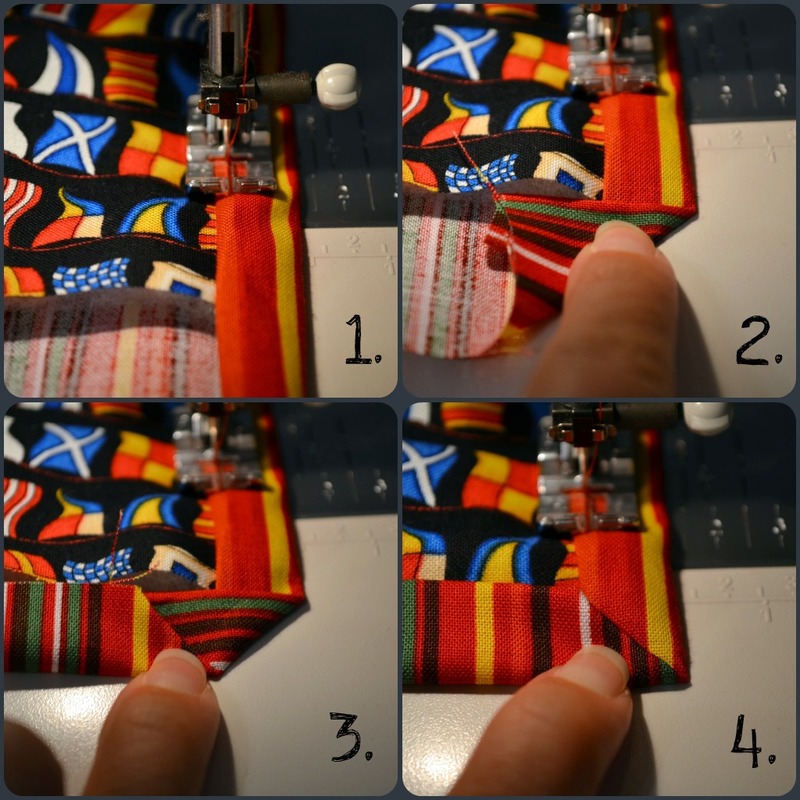 I took some pictures to show how I did this in case you aren't familiar with this method. Please forgive me for the dark pictures. It seems like I can only get things done in the sewing corner at night. So here is what I started with. A quilt sandwich ready to bind. I stitched it together and then trimmed the extra batting close to the stitch line. Then pressed it flat, ready to add the other borders in the same fashion. Here it is with all the borders on.. See how the backing fabric sticks out by one inch on all sides. Because I was already burnt on finishing this quilt (and I didn't have anymore coordinating fabric) I chose to use the easiest method I know to bind it. I don't know what the name is but you basically use the backing fabric and fold it over and stitch it like a hem. I don't see this binding used in blogland much...maybe it's a cop out method? It's fast though and for that reason I like it! Plus, it is really easy to get a perfect mitered corner this way. One more project checked off the list!! My kids would love that quilt. Then they wouldn't have to bug me to get out the big map all the time. Thanks for the tutorial too. This is fabulous. I love the way the quilting makes the latitude and longitude lines.